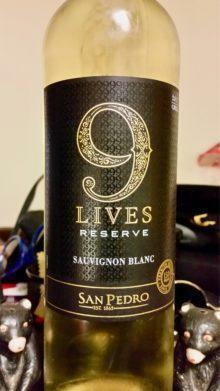 The 9 Lives Reserve Sauvignon Blanc 2017 is sourced from vineyards in the Central Valley of Chile. 9 Lives is one of San Pedro winery (founded in 1865) wine brands, others you may be familiar with are Epica and GatoNegro (translates to black cat) and since 9 Lives is also a cat reference I think the Reserve designation indicates that this is a level up from the GatoNegro wines, though the 9 Lives should be found for under $10. This is a young wine, simply produced to keep the wine bright and fruit-forward, stainless steel vats used for fermentation and whatever aging was involved. This Sauv Blanc is a fairly low alcohol wine, 12.3%. So, there it is a simple, affordable, everyday White wine from Chile. The color is a clear, pale wheat yellow, the bottle seemed to show an olive tint, but that disappeared in the glass. The nose is a mix of citrus and tropical fruit, lemon, grapefruit, pineapple, guava, a little spice, and some stone fruit. This Sauv Blanc has a bit of a rounded mouth-feel, with that said there is also a good deal of tart citrus flavors and abundant acidity (would do well as a food wine, think spicy Thai or Mexican with some heat. It tastes of a mix of peach and grapefruit, light lemon, pear, and lime. The mid-palate offers melon, a hint of spice, and sharp, tart tropical fruit. The acidity is solid, it does not interfere with sipping pleasure and would really balance out with food. The finish is softer than the body of the wine, but does linger. The 9 Lives Reserve Sauvignon Blanc 2017 is basically what an everyday wine is supposed to be, easy on the wallet, versatile, and tasty. It is plenty good enough to bring to that cool Chinese BYOB in town and goes down nicely as a patio sipper. As for Sauvignon Blanc, I am fond of New Zealand, Loire Valley (France), or Bordeaux, but if you are looking for a well priced Tuesday night Sauv Blanc, Chile is a great place to look.